The No. 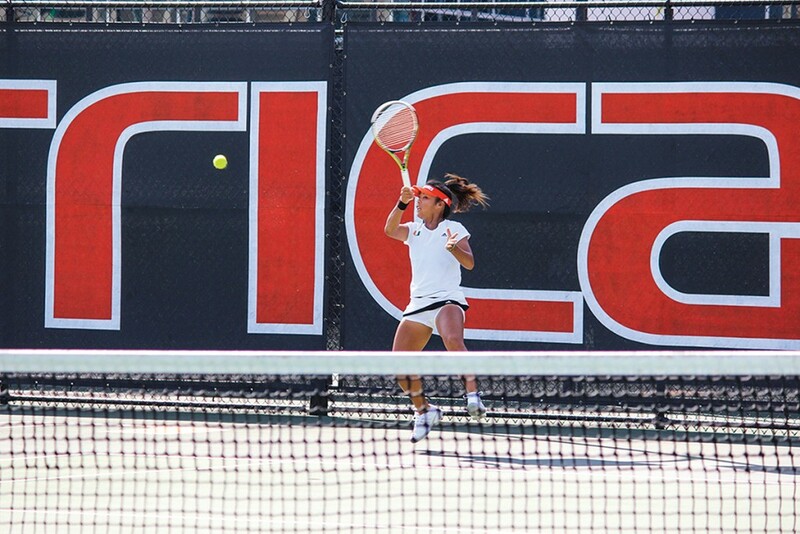 7 Hurricanes women’s tennis team continued its dominant spring with a 7-0 sweep against No. 29 Clemson on Saturday. After a flawless month of March, the Canes are now riding a nine-match winning streak. Miami battled through difficult weather conditions in South Carolina as wind gusts reached more than 30 miles per hour. “We had to embrace the environment today,” Miami Head Coach Paige Yaroshuk-Tews said to HurricaneSports.com. The Canes (13-4, 8-2) clinched the match with No. 6 sophomore Sinead Lohan’s victory in straight sets. Sophomore Wendy Zhang recorded her first career win against a top-25 opponent, beating No. 20 Joana Eidukonyte in two sets. The men’s tennis team, on the other hand, would like a redo to its spring schedule. The Hurricanes have lost four consecutive matches after falling to Georgia Tech and Clemson over the weekend, dropping their record since the beginning of March to 3-8. The Canes’ loss to Clemson on Sunday was the closer of the two affairs as they were defeated 4-3. The match started with the Canes (7-11, 2-6) trailing early when they lost the doubles point. Miami came back from a 3-1 deficit to tie Clemson with one singles match remaining, but freshman Fermin Calvo lost in straight sets to Clemson’s Austin Ansari. The Canes did not fare any better when they faced Georgia Tech on Friday, losing 5-2 to the Yellow Jackets. The Canes lost the doubles point and continued to struggle in singles play, as only Calvo and junior Jesse Flores came away with wins. The men’s team next plays North Carolina State at 2:30 p.m. on Friday in Coral Gables, while the women’s team travels to North Carolina to play Wake Forest at 4 p.m. also on Friday.